There are well over a third of a million different kinds of beetle across the world and by no means all of them are pests – many are positively beneficial particularly in the garden. However, a number can pose a serious nuisance, either to crop and garden plants or as household pests. Some beetles attack the fabric of our homes. Woodworm are not a kind of worm at all, but the larvae of the common furniture beetle (Anobium punctatum) – a dark brown insect some 5mm long. After mating in spring or early summer, the female lays around thirty eggs – in batches of two or three – in cracks or joints in timber. The young hatch within a month, boring into the wood, where they will remain for up to five years, tunnelling through your floor boards, furniture or beams. As the larval stage comes to an end the “worm” chews its way towards the outer surface, creating a chamber in which it will pupate. Biting a 2mm cap off its chamber – leaving behind a characteristic hole – it eventually emerges as an adult beetle and flies off in search of a mate and the process begins again. A variety of products are available to deal with small scale infestations, however, professional help is probably called for to deal with larger numbers. The Death Watch Beetle (Xestobium rufovillosum) is another wood boring beetle which can be a serious problem. At around 8mm in length, it is larger than the Furniture Beetle and can be distinguished by the yellowish patches on its chocolate brown body. It is mainly associated with oak – typically the beams in old buildings – though it may be found in any partially decaying hardwood and can often be detected by the characteristic tapping sounds the adults make, particularly between March and June. Generally speaking, if this beetle is suspected, it is again time to get professional advice. House beetles (Dermestes sp.) – there are four species of this pest – are generally dark brown and between 6 – 10mm in length. They are often found in kitchens and dining areas where they feed on overlooked food scraps, though they may also be seen under floorboards, in the roof space or inside disused chimneys, where old nests and dead birds offer a source of food. Eggs are laid nearby, the brown and yellow striped, bristly larvae which hatch feasting for a while, before pupating into adults. The main step in controlling an infestation is to find the food source and remove it; regular inspection and thorough cleaning being important once this has been done, to ensure that the beetles do not return. The use of a general purpose insecticide will complete the treatment for a small infestation. Beetles can be garden pests too. For example, brown click beetles (Agriotes lineatus and obscurus) eat the leaves, flowers and pollen of plants while their soil-living larvae – called wireworms – are responsible for serious damage to roots and tubers. The vine weevil (Otiorhynchus sulcatus) is also a widespread pest. Once confined to pot plants such as cyclamen and begonias, it now eats its way through many different kinds of roots, bulbs, corms and tubers. Although they resemble them outwardly, cockroaches are not true beetles, but belong to a different group of insects. They are nocturnal scavengers, spending the day hidden in dark secluded cracks, emerging after dark to feed on almost anything from animal droppings to food for your own table – hence a big part of the problem! The two varieties of cockroach most commonly found in Britain are the “German” (Blatella germanica) and the “Oriental” (Blatta orientalis). Both are quite large insects, but at 20-24mm in length, the Oriental is around twice the size of the lighter coloured German species. Both kinds breed freely, producing egg cases every 3-6 days, each containing 15 or more eggs which hatch, not into grubs, but into small near replicas of the adults. While the juvenile Oriental cockroach may take up to two years to attain adulthood, the German can itself be breeding the next generation in under four months. They can carry a variety of human diseases – including dysentery and gastro-enteritis – on their bodies and their all-inclusive feeding habits inevitably mean that there is an enormous potential for food intended for human consumption to be contaminated. A cockroach infestation is a serious thing and professional help will be needed to bring it under control. 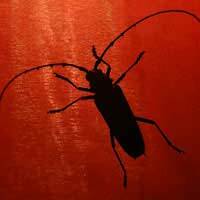 There are obviously many more species of beetle pests than the ones mentioned here and even the much smaller cockroach clan boasts a further seven types around the UK. The wide diversity of these creatures makes generalising about them difficult and when it comes to pest control, “know your enemy” is an essential maxim to follow. If in doubt, dealing with any persistent or large scale infestation of this kind is probably best left to the experts. Can You Spot the Signs of Pests? Forgot to add re beetlle long and slim. My daughter has found under the bath alongside woodworm infestation about to deal with it a beautiful looking beetle about one inch long mostly green with brown tinge at edge of body she has kept it until identify it? Any clues?